These words lifted from editor Leslie Yazel — as she introduced the holiday issue of Real Simple — commanded my attention. I sipped my coffee, twirled back and forth on my kitchen stool, stared at the leafless tree outdoors, and pondered: Does it have to be this way? Particularly in the month of December, my heart goes out to moms. Year in and year out, she doesn’t just give gifts; she gives heart, soul, and self in order for the rest of the family to be blessed. And for those of us in this role, we want so badly to get it right that we sometimes lose our way along the way. Your personal expectations - your goal is not to create the perfect Christmas; God already did that for us when He sent Jesus. Your goal is to honor Him as you love and bless those in your sphere of influence. Your personal goals - be selective. Not every tradition has to be incorporated into the calendar, not every community event has to be attended, and not every cookie recipe has to be baked. Your personal reading - this is not the time to tackle that thousand-page volume; instead, treat yourself to an audio book or a series of treasured short stories relevant to the season. Moments with individual family members - look for interludes with each child in order to hear their heart in the sea of celebration. Moments with your husband - sit by the fire, sip cocoa, and enjoy the music that marriage can bring. Moments with relatives you rarely get to see - take the initiative and invest moments in corner conversations. You will leave the gathering enriched, and so will they. Your planning – keep it simple. Place a 3 x 5 card beside your bed. Carry it with you as you move through your day. Create categories of Decorate, Shop, Cook, Attend, and Miscellaneous. Check off items completed, and move forward those items still remaining. Continually ask God to fill you with the knowledge of His will through all spiritual wisdom and understanding (Colossians 1:9B) so that you can confidently make wise decisions. Review at the end of each day, and start over the next. Protect your sleep - resist the urge to stay up late just because the house is finally quiet. Rest will work wonders for your personal bandwidth. Eat fruit and vegetables, and don’t forget the protein - in the midst of holiday’s festive fare, be mindful to incorporate healthy foods, as well. 1. 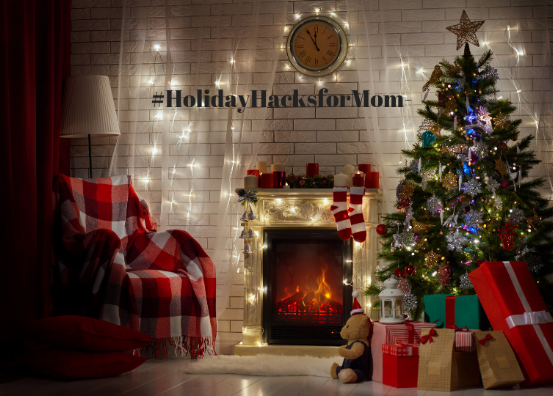 If these #HolidayHacksforMom seem overwhelming, select just one to use. How it can be helpful to you? So,teach us to number our days, that we may present to You a heart of wisdom (Psalm 90:12 NASB). 2. Why is Colossian 1:9B more than just a good suggestion? 3. What transpires within our souls when we allow every star of expectation or commitment of this Christmas season to stop with Jesus? How will this discovery make a difference in your desire to bless, not impress, this December? Older PostMay I Please Have Your Recipe?